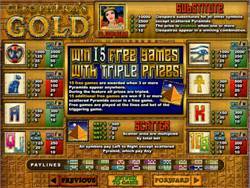 Cleopatras Gold Slot Information, Screenshots and which online casinos offer Cleopatras Gold Slot for Play. This Online Slot is an RTG Slot with a Bonus Feature and random Jackpot. Slots Plus Casino is an RTG Casino that offers many slot games including Cleopatras Gold Slot. Cleopatra was the last Pharaoh of Egypt. She was not Egyptian, but Macedonian Greek, descended from Ptolemy I. Both Julius Caesar and Mark Antony fell in love with Cleopatra. There love eventually cost them their lives. Cleopatra was the only Pharaoh in the 300-year Ptolemaic dynasty who could speak Egyptian. Get 3 Pyramids and Receive 15 Free Spins! 5 Reel, 20 Payline Progressive Video Slot featuring Free Spins, Multiplier, Wild and Scatter Symbol. This slot game is set in the Egyptian desert, with interesting Hieroglyphics in the background; players get the feeling that they’re entering an ancient pyramid. The Egyptian Queen Cleopatra tries to help her royal subjects to achieve their dreams of winning! The coin value ranges from 0.01 to 5.00, and Progressive Jackpots are awarded randomly. The Wild symbol replaces any other symbol except for the Scatter symbol. Cleopatra can show up anywhere on the reels, when a winning combination is formed with the Wild, the win will be doubled. Land 5 Cleopatra symbols on an enabled payline to win 10 000 coins! 2 or more Pyramids anywhere on the reels will gaward double the bet . When 3 or more Pyramids appear on the reels 15 free spins will be awarded. All winnings will be multiplied by 3, and the free spins can be retriggered! The progressive jackpot appears randomly and doesn’t depend on the bet or the combinations appearing on the enabled paylines. Jackpot winnings get added to other wins. 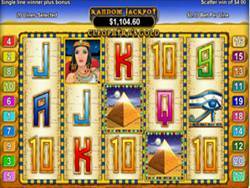 Win a fixed jackpot of 1 000 coins when 5 Scarab or 5 Cat symbols appear on an enabled payline. The graphics are excellent quality with some entertaining animation effects. The music is quite catchy, especially in the free spins bonus round. Get to explore Egypt and the many well known landmarks, unlock a variety of bonuses but be careful not to be hit by the Mummy’s curse for that win!